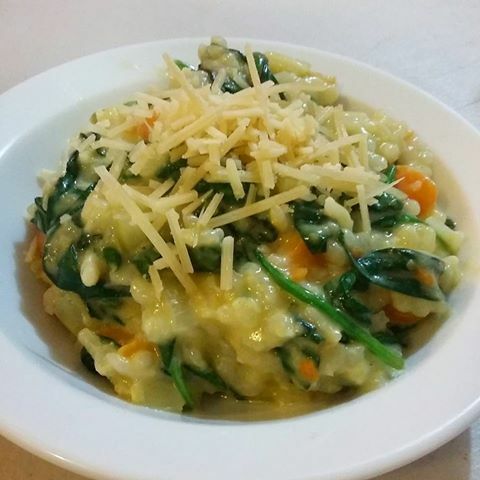 Risotto takes time, but this tasty dish is packed with vegetables, homemade stock, homegrown greens and sweet potato. Enough for a big family dinner and leftovers for lunch, yum! You can make fresh stock or use pressure canned chicken stock in this recipe. 1. Heat oil and butter over low to medium heat in a large stock pot until the butter has melted. 2. Add the onion and garlic. Sauté for 1 minute. 3. Add the celery. Sauté for 1 minute. 4. Add Arborio rice, stir and cook until rice becomes opaque. 5. Add the wine and stir until reduced. 6. Add 1 cup of stock and the sweet potato. Stir and cook over low-medium heat until all the liquid has been absorbed. 7. Add stock 1 cup at a time, stirring and cooking gently until liquid has been absorbed then repeat until all of the stock has been added and the rice is cooked (around 30 minutes or so in total cooking time). 8. Remove from heat. Add baby spinach and cover pot with a lid. Wait 5 minutes then stir through spinach until wilted and mixed through the risotto. 9. Add parmesan and cream and mix well. 10. Serve risotto topped with extra parmesan. 11. Refrigerate leftover risotto immediately. Risotto will keep in the refrigerator for up to 24 hours and it can also be frozen in airtight containers for up to 4 weeks, but is better being fresh and hot for lunches the next day. 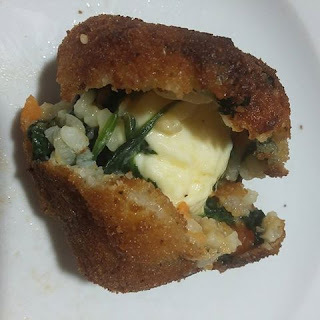 Leftover risotto is delicious in mozzarella arancini - recipe added tomorrow!